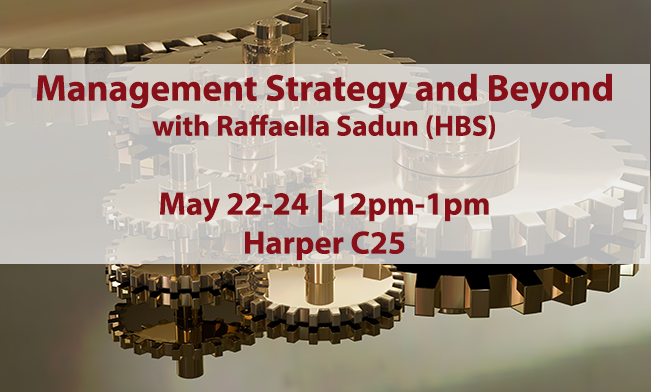 Whistleblowers, studies show, play a crucial role in detecting fraud and corporate malfeasance. But while they serve an important role in uncovering wrongdoing, whistleblowers are exposed to enormous risks: A 2008 analysis by Alexander Dyck, Adair Morse, and Luigi Zingales found that whistleblowers often stand to lose much more than they gain by deciding to come forward. They are often fired or forced to quit under duress, shunned by friends and colleagues, and exposed to personal attacks that could harm their ability to find future employment. 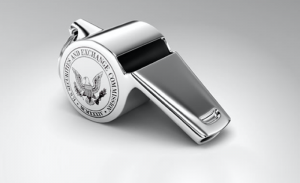 As a way to incentivize whistleblowing following the 2008 financial crisis, the Dodd-Frank Act has equipped the SEC with new powers to protect and reward whistleblowers. The SEC’s Office of the Whistleblower, which was established in 2011 following Dodd-Frank, hands out financial rewards worth 10-30 percent of sanctions over $1 million to whistleblowers who come forward with original information that leads to a successful enforcement action—to date, it has awarded more than $111 million to 34 whistleblowers. In early February, President Trump signed an executive order that sets the stage for a dramatic rollback of the Dodd-Frank Act. While Trump has since said he’ll “keep some” of Dodd-Frank even his planned “major elimination” of regulations, the president previously promised to dismantle President Obama’s overhaul of financial regulations, which he has repeatedly called a “disaster.” Since details about Trump’s planned financial reform are still scarce, it is unclear whether it will affect the SEC’s Office of the Whistleblower: some experts believe it won’t be affected, but there have been reports that House Republicans are targeting the whistleblower program as well. 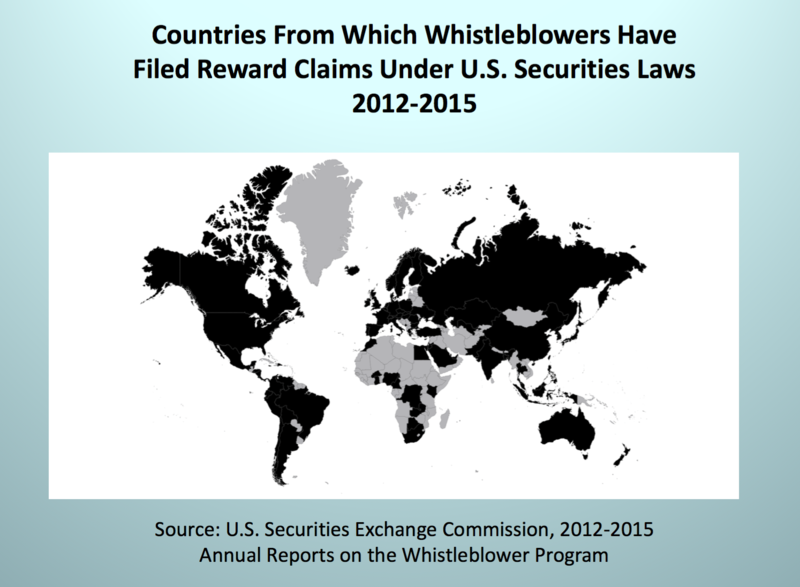 Regardless of the fate of the SEC program, the participants of the Toronto conference all agreed that more protections and financial rewards are crucial to incentivize more whistleblowers. “For an employee to put their career on the line, it is unrealistic to think they’ll do it because they’re a nice person or they have high moral values,” said Stephen Kohn of the Washington DC law firm Kohn Kohn & Colapinto, who is also the executive director of the National Whistleblower Center. Studies have previously shown that whistleblowers are motivated primarily by moral reasons. A 2013 study by Adam Waytz, James Dungan, and Liane Young found that fairness and justice are the primary drivers for blowing the whistle. Examining a survey of approximately 42,000 federal employees, they also found that when it comes to the decision to report wrongdoing, moral concerns are more significant than pragmatic considerations, such as personal benefits. In a piece published in ProMarket in August, Waytz argued that the current U.S. whistleblower program “prioritizes a relatively weak incentive—money—and rarely pays out” and that a more effective system would not do away with monetary rewards, but also recognize “the drive for justice motivating so many whistleblowing decisions” by, for instance, levying more meaningful fines against offenders. Kohn, however, objected to the suggestion that a whistleblower program should be based on moral values. 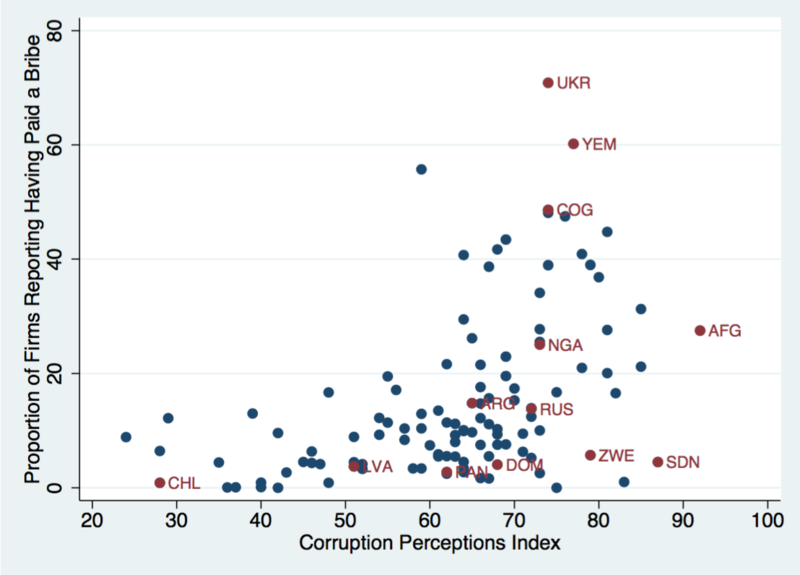 “If your white-collar crime detection program is based on nice people having high moral values, corruption will flourish. Why not just admit to it and make bribery and corruption legal? You’ll never catch it,” Kohn said. The conference, which took place at the Rotman School of Management in Toronto, was moderated by Dyck and featured a panel discussion between Call, Kohn, Heidi Franken of the newly founded Office of the Whistleblower within the Ontario Securities Commission, and Peter Dent of Deloitte, who is the former chair and president of Transparency International Canada. The panelists discussed the enormous risks facing whistleblowers, particularly as new technologies increase the danger of their losing anonymity, and ways to provide whistleblowers with protections against retaliation. Much of the debate, however, revolved around the issue of financial rewards for whistleblowers and their effects on whistleblowers, fraud detection, and markets. 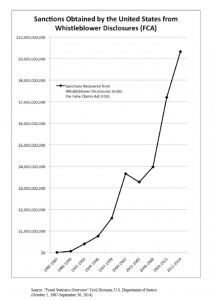 Despite the widespread media coverage that the financial rewards given by the SEC have received in recent years, the probability of receiving an award is still very low: only 0.2 percent of the tips given since Dodd-Frank went into effect have resulted in rewards, said Call. Source: Stephen M. Kohn (2017). 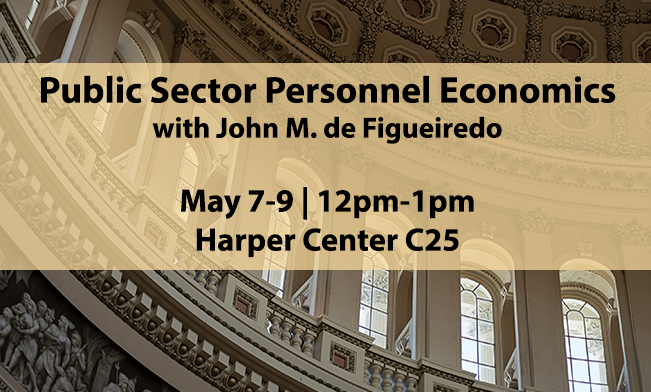 The rest of the event focused on the positive effects of whistleblowers on markets and their exposure to employer retaliation. Call, an associate professor at Arizona State’s W. P. Carey School of Business, shared insights from his recent search into regulatory regimes regarding whistleblowers in the U.S. 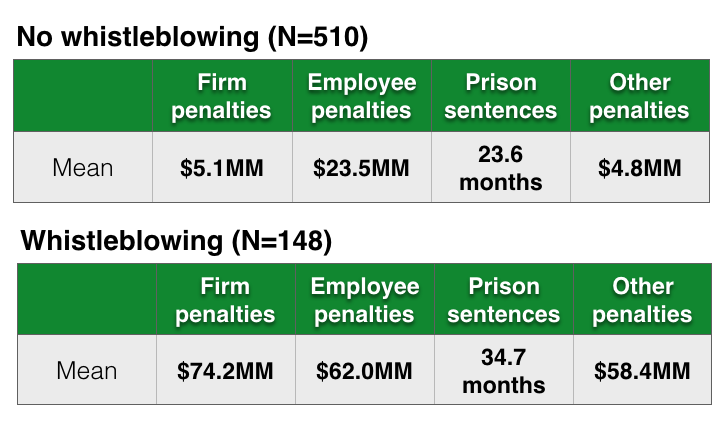 Examining all SEC enforcement actions since the Sarbanes-Oxley Act of 2002, Call and co-authors found that whistleblower involvement is associated with larger penalties for firms and longer prison sentences for wrongdoers: firm penalties are 8.5 percent more likely when a whistleblower is involved than when not, and top executives are 6 percent more likely to face prison sentences when there’s a whistleblower. In a recently published study with Simi Kedia and Shivaram Rajgopal, Call and his co-authors tried to answer the following question: if regulators provide financial incentives to encourage whistleblowing, do firms provide financial incentives to discourage whistleblowing? In order to examine this, Call and his co-authors identified 663 firms that were accused of financial misreporting between 1996 and 2011 and then examined the number of stock options granted to rank-and-file employees during the period when the alleged misreporting took place. What they found is that firms do indeed grant employees more stock options during periods of misreporting. 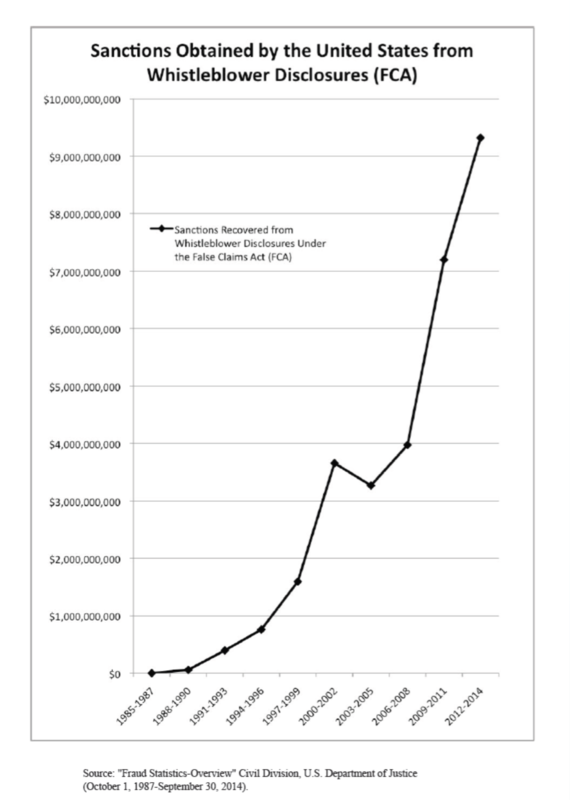 While non-misreporting firms grant employees 1.62 percent of shares outstanding in the form of stock options, misreporting firms grant employees 2.49 percent. 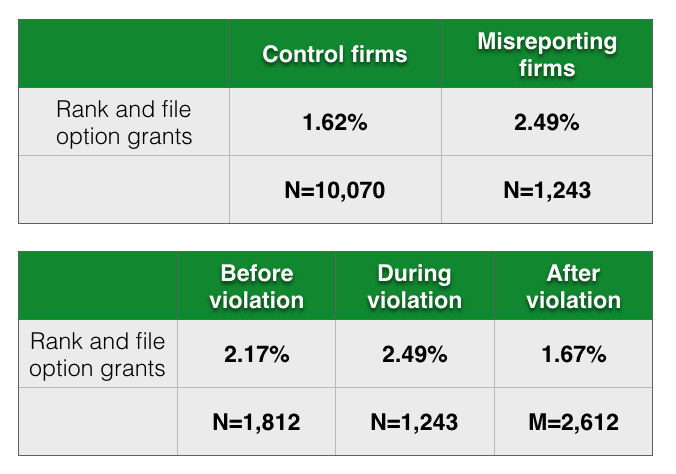 Misreporting firms, according to the study, grant 2.17 percent before misreporting, 2.49 percent during periods where they misreport, and 1.67 percent after violations cease. 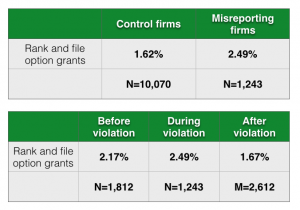 Misreporting firms grant employees more stock options during periods of misreporting. Source: Call (2017). This strategy, they found, is effective in discouraging whistleblowers: misreporting firms that avoided whistleblowing gave employees 2.44 percent of shares outstanding in stock options, while firms who were reported on by whistleblowers gave 1.37 percent. 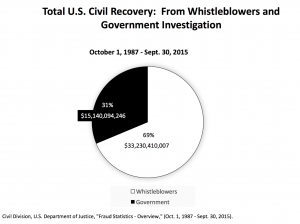 “If you don’t grant as much, the odds of whistleblowing allegations go up,” said Call. 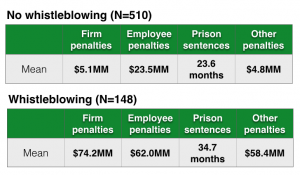 Whistleblowers are less likely to come forward when employers provide financial incentives to remain quiet. Source: Call (2017). In light of the risks facing whistleblowers, Kohn argued for strong financial support to whistleblowers. As an example of the possible benefits that financial incentives to whistleblowers might generate, he pointed to a former client of his: Bradley Birkenfeld, the former UBS employee who blew the whistle on the ways in which UBS and other Swiss banks helped American citizens evade their taxes. Birkenfeld, who served two-and-a-half years in prison for his role in the tax evasion scheme, received a $104 million award from the SEC in 2012, a decision that was controversial at the time.